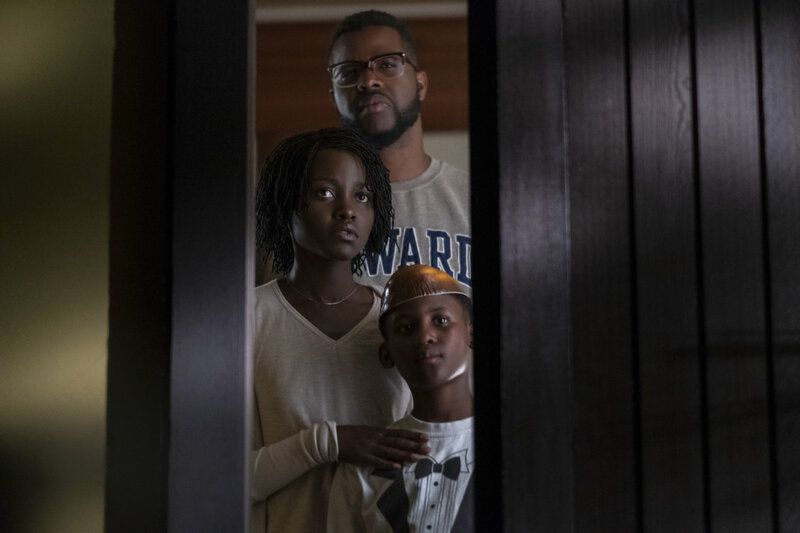 Jordan Peele (GET OUT) is back with his second effort in the director’s chair and he’s showing us that his first success wasn’t a fluke. US begins in 1986 on the seaside boardwalk of Santa Cruz where little Adelaide (Madison Curry) is vacationing with her parents. Adelaide wanders off to the beach where she enters an abandoned funhouse only to come face to face with her doppelgänger. The incident traumatizes the child but through dance therapy she’s able to move ahead with her life. Fast forward to the present day and adult Adelaide (Lupita Nyong’o, BLACK PANTHER; STAR WARS: EPISODE VIII – THE LAST JEDI; STAR WARS: EPISODE VII – THE FORCE AWAKENS) is now happily married to Howard University alumnus Gabe Wilson (Winston Duke, BLACK PANTHER; AVENGERS: INFINITY WAR) with two children, Zora (Shahadi Wright Joseph) and Jason (Evan Alex). When the Wilsons take a vacation near Santa Cruz, Adelaide feels anxious that whatever happened to her years earlier is going to return. It’s not long before she’s proven right as four people who look identical to the Wilsons show up in front of their rental home just as the power in the area goes off. Like GET OUT, US is much more than just a simple horror/thriller. Often funny (Peele started out as a comedy writer and performer, after all), the film is also a social commentary about life in America today. The film’s title could also be read as U.S., meaning that the doppelgängers don’t just look like the average American, they are the average American. The only difference between the two groups is privilege and advantage. Though neither as deliciously insidious nor as terrifying as GET OUT, US still is a brilliant piece of work with great camerawork and excellent performances throughout. Nyong’o is wonderful both as the protective mother and as her doppelgänger who has meticulously planned for 33 years to make her return. Elisabeth Moss (TV’s MAD MEN and THE HANDMAID’S TALE; QUEEN OF EARTH; LISTEN UP PHILIP) is also superb as Adelaide’s deadpan bitchy, White-privileged friend, Kitty Tyler. US is the kind of movie you’ll want to watch a few times to catch all the nuances but, at the very least, you owe it to yourself watch it once. It’s one of the best films I’ve seen so far this year!